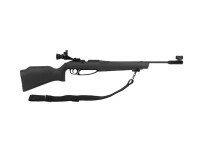 Caliber: 0.177" (4.5mm), Stock: Synthetic, Competitors will enjoy the accuracy of this target rifle, Lothar Walther barrel, match-type sights and full-length synthetic stock. Adjustable trigger pull length from 12" to 13.75"
Adjustable trigger pull to 2 lbs. Daisy's Match Grade Avanti Model 753S is designed and engineered for the intermediate competitive shooter. From local matches to national competitions, competitive shooters require a dynamic combination of superior accuracy and exceptional balance. This is the ideal rifle for competitive shooters who know that accuracy is fundamental to winning matches, and the 753S incorporates all of the features required to succeed. Every feature of this rifle is geared toward obtaining the greatest accuracy, such as the comfortably adjustable stock and the adjustable diopter rear sight. The Lothar Walther barrel is constructed of high-grade steel, and it has a right-hand twist, and 12 lands and grooves. Its precision bore is sized for match pellets. Trigger pull length is adjustable from 12 inches to 13.75 inches. Click the Ammo link for our list of suggested match pellets. Find targets, safety glasses, and other gear by clicking the Accessories link. Things I liked: Very well made fun. Amazing accuracy with a scope. Great value. Things I would have changed: Trigger could be a little better. Things I liked: This is a a better rifle than I am a shooter. I need to learn to make the most of it. Things I would have changed: The instructions are lousy. I figured out how to put the shooter sling after some trial and error. What others should know: The instructions specify lead pellets, but when I contacted Daisy they said any 4.5 pellets were okay. I can shoot ten meter in my house without lead. Things I liked: This is a very fun rifle straight out of the box. Just one pump stroke, load, and shoot. Accuracy is excellent. Things I would have changed: The trigger leaves a lot of room for improvement. This can be fixed pretty easily if you are so inclined. Polish the sear and hammer surfaces, trim 2 springs (optional), and install a screw behind the trigger guard. There are many sets of instructions available. I knocked it down a star on value because improving the trigger coming off the factory line shouldn't add much to Daisy's production cost, but would make dramatic improvements in developing young shooters talents. What others should know: This rifle is designed to get kids and teens involved in shooting sports. It is simple to shoot and very accurate. Since nothing is addicting like accuracy, it has been very successful. No part of this rifle is world class competition grade, but it isn't supposed to be. It's meant to be a starter rifle for individuals not willing or able to start off at the >$1,000 level. I enjoyed the sights, but decided to add a TKO brake so as not to arouse neighbor's suspicions while taking out pests in the backyard. Since I had to take off the front sight with the TKO, I added a Hawke 2-7 x 32 AO scope. It is very accurate and ridiculously quiet now. What kind of ammo should I use? New to guns...for my grandson to start practicing for competing in 4-H... not sure what size "grain", flat? pointed? If you want to try lead-free .177 caliber ammo, the Crosman 'fast flight' penetrators seem to shoot rather well for me in my 953 Target Pro, which is virtually the same air rifle as this 753, except mine is the budget version. Competitors will enjoy the accuracy of this target rifle, Lothar Walther barrel, match-type sights and full-length synthetic stock.